Every kid loves to giggle. You know they do - their chuckling even gets on your nerves, especially when you hear those muffled little snickers at the wrong time. I won't blame you if you try to forget those days when the little chortles get on your nerves. But do remember how much they enjoy laughing, when your are choosing read-aloud material. It's THE key to their undivided attention. So, if your reading aloud sessions are becoming too boring - not only to your child, but to you too - turn to laughter. If you only focus on reading masterpieces of children's literature to your kids - without leaving some space for pure, mindless fun - reading might become too much of a chore for all involved. We need to ensure that reading aloud is not equated in the young mind only with drop-dead serious books that can overwhelm the listener. Sometimes kids want to relax, laugh and enjoy a book for its comical power. They want to giggle, while sitting upside-down on the sofa. Yet, comedy is a noble teacher too. It helps us learn that life is best enjoyed with a smile on our faces and that we are all human, after all. I never hide the fact that I positively love book sets and that I make an effort to collect as many good ones as I possibly can - as they are excellent for hooking kids onto reading. Kids love to follow the same characters through and through, delving into numerous stories, which makes it much easier to smoothly transition between books for our read-aloud sessions. If kids love the first book in the set, they are automatically prepared to listen to the remaining three or even 33 books from the same set. Book sets = lots of reading! Our home library includes enormous book sets such as the dark and moody A Series of Unfortunate Events, the impossibly cute World of Peter Rabbit, the Rockefeller set of the children's book world (New York Review Children's Collection), among others (links to my earlier reviews). 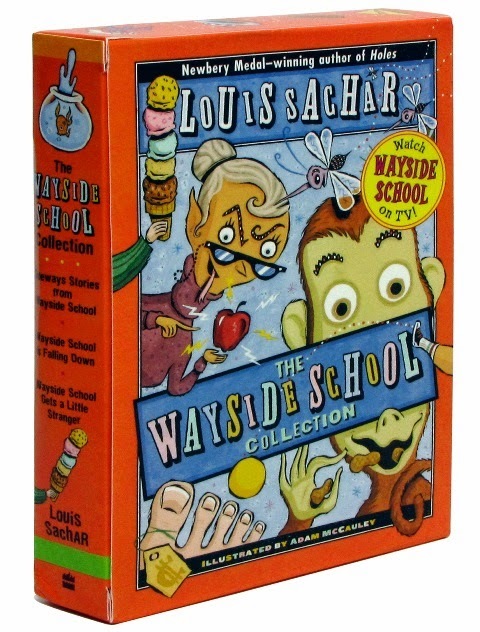 But I love small book sets too and The Wayside School Collection is fabulous addition to anybody's home library. 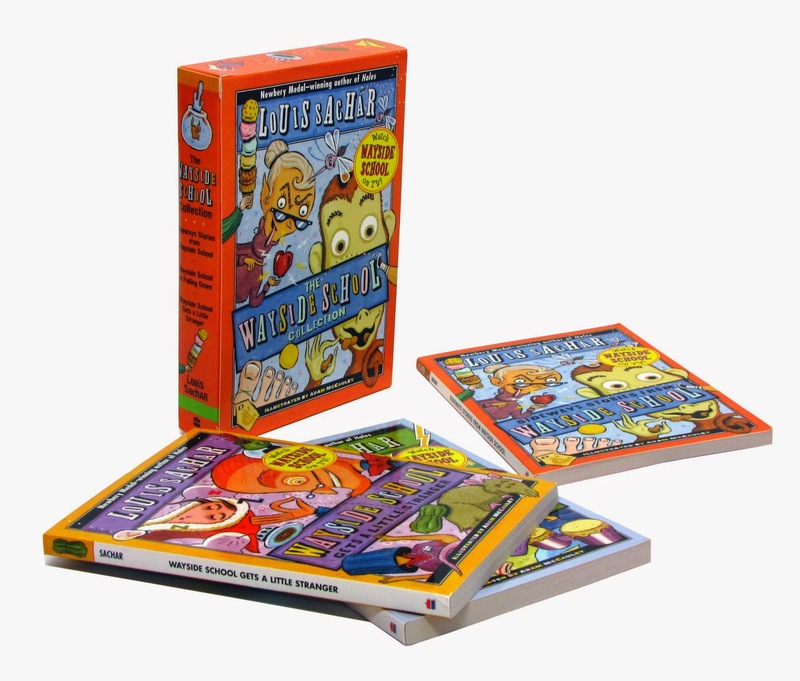 This set consists of three Wayside School books penned by award-winning author Louis Sachar - renowned for receiving a Newbery Medal for his children's novel Holes. 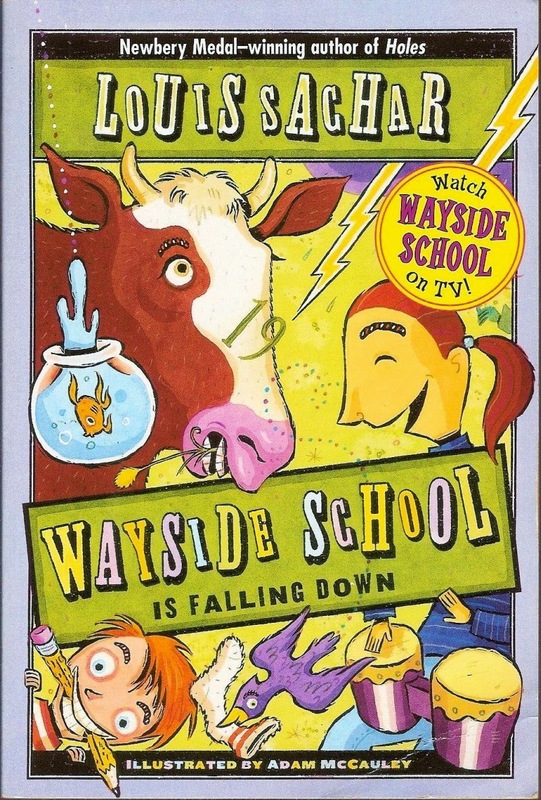 My kids were not familiar with Canadian animated TV series Wayside developed for Teletoon and Nickelodeon based on Louis Sachar's books, but your children maybe are. Books are books and rest is ... not books. We are currently finishing book no. 3 and my kids adore the wacky stories and the unexpected plot lines. Each chapter in the books focuses on a specific kid or a certain situation that usually take place in Mrs. Jewls's class on the thirtieth floor or somewhere in Wayside School, which is an unusual school because it is 30 stories high. Mrs. Jewls's class is on the top floor of the school building without an elevator. 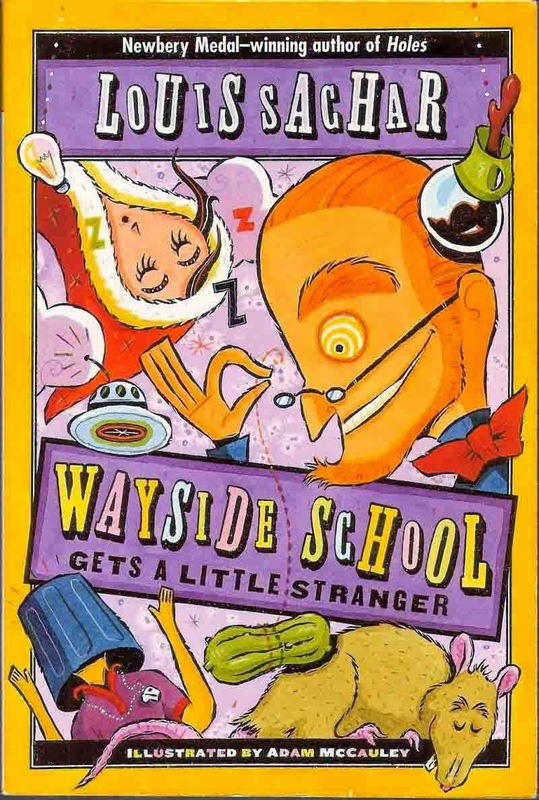 OK, Read Aloud Dad, you say - so what is so special about the Wayside School books. First of all, its not only the books. Children love reading quirky books that involve school settings as they spend most of their days in prison school. These books - of course - have to be offbeat or interesting in some other form, which allows them to compare their own experiences to the fictional school and the fictional kids. These Wayside books are crazy, crazy, crazy. Every story has an unexpected twist to it. There are 30 stories and they just go from strong to stronger. 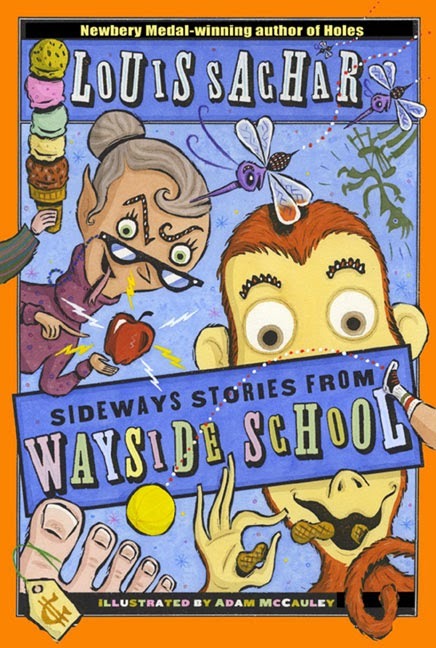 They are all interlinked loosely and many characters from one story appear in the next story, but Wayside School remains the main "character" in the background of all 30 stories. For example, there's the story about Joe (Chapter 3), a pupil who counts five pencils like this: six, eighteen, two, fourteen, five. Or when he counts three books on his desk he counts: a thousand, a million, three. Every time he counts the wrong way, he gets the right number. But his teacher informs him he is counting wrongly. When Mrs. Jewls teaches him how to count correctly, Joe never gets the end number right. Then there is the story of Todd (Chapter 5), a thoughtful boy in class who gets into trouble with the teacher ... every day. Todd goes to home EVERY school day early at noon with the kindergarten bus. Ms. Jewls has a strict Three Strikes and You're Out policy. The first time a kid strikes out, the pupil has to write his/her name under the word DISCIPLINE on the blackboard, the second strike requires the pupil to write a check next to his name and the third strike means the name is circled and the pupil has to return home early on the kindergarten bus. Todd leaves early every single day - as the Gods conspire to send him home every day at noon. Even when he is on his best behaviour... he ends up on the bus by force of circumstance. And, then there is the story about Bebe (Chapter 6) who is a girl with cropped dark hair and a "beebee nose", but what made her stand out was that she was the fastest drawer in Mrs. Jewls's art class. She could draw as many as 50 cats, a 100 flowers and almost two dozen dogs during the duration of a typical lesson. So, her classmate Calvin - instead of drawing for himself - serves as her assistant by standing next to Bebe and feeding her papers and crayons. Mrs. Jewls is curious why Calvin used up the entire duration of the art lesson to assist Bebe, instead of drawing something himself. "Don't you like art," inquired Mrs. Jewls. "I love art," said Calvin. "That's why I didn't draw anything," said Calvin. That's a lovely example of Sachar's dry wit. In fact, that is exactly Sachar's forte. His implied humour or indirect humour - greatly relies on the well-oiled grey cells in brains of listeners - thus keeping attention levels very high. Then there is the story about Paul (Chapter 10) who had the very best seat in the class. The seat in the last row, farthest from the teacher. And during every lesson, Paul did not pay any attention. His mind was wandering around. In fact, it wasn't exactly wandering. But on one thing only. A thing that was dangling right in front of his eyes. Leslie's pigtails that were swaying all day in front of his nose. And Paul's mind wanted just one thing - to give those pigtails a nice, strong jerk. But Paul kept fighting his urges and knew that if he pulled on a pigtail, Leslie would tell him to the teacher and everything would be over. I could keep on telling you more about the stories that are based on Louis Sachar's experiences as a yard teacher in a school during his college years ... but I won't. Can't help but love Louis Sachar. His books in this book set are illustrated by Adam McCauley and my twins loved the pictures - one at the beginning of every chapter. These are not the original illustrations fro the first edition and if you had an earlier version of the book, you may not be "happy" with new illustrations, but this should not detract from the merit of the stories. The proof of this collection is in the pudding and in the laughter of your little (and not so little) ones. Finally, here is a challenge. If you don't laugh at the gravity lesson that Mrs. Jewls teaches the Wayside school kids with the help of a brand new computer - (you will find it in book no. 2) well, that may simply mean that you should read more - not less - funny children's books. Awaken that funny bone in your body. Anyhow, days of mind-numbing fun await you when you take up Wayside book no 1. There is nothing better than the first read of a great collection.